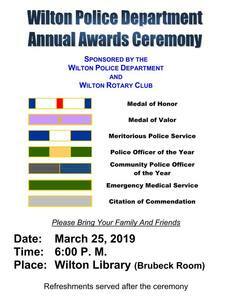 The Wilton Police Department will hold their Annual Awards Ceremony on Monday, March 25 beginning at 6:00 pm at Wilton Library. The event is co-sponsored by the Department and Wilton Rotary. "Please join us in recognizing our officer's achievements," says the Wilton Police Department.